“Wheels down and rolling” as we left the peaceful space of the Franciscan campus and emerged into the city of Cleveland. Before our lunch stop, the amazing NETWORK staff led us through a series of reminders about how to remain secure during an active shooter episode. We reviewed plans for participation in the Circle the City with Love community action. 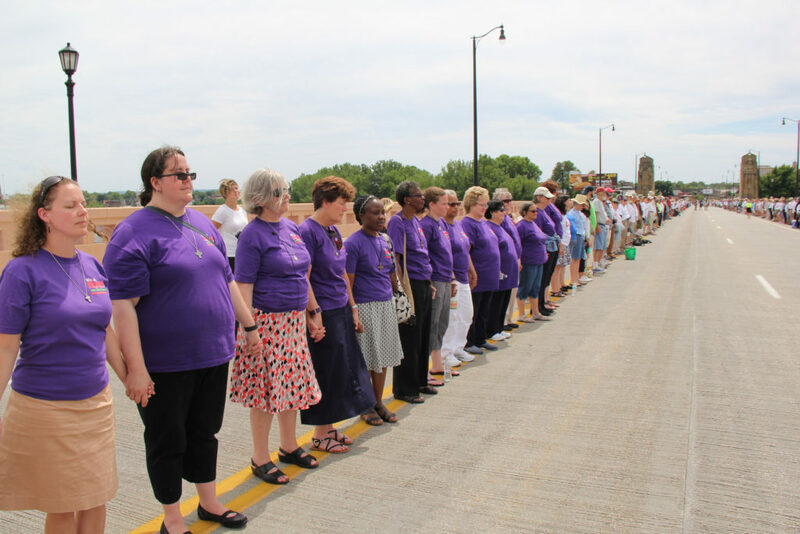 We met inside Cleveland at the Hope Memorial Bridge where a crowd of thousands of citizens met to line the bridge in order to Circle the City with Love. In prayerful silence, the participants demonstrated the power of prayer and the strengthening of community by joining hands and forming a continuous circular community. It was a powerful, visual expression of solidarity strength of the power of love in today’s world. 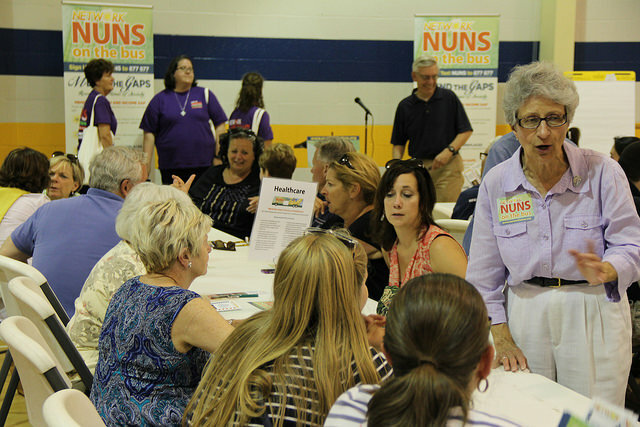 St. Leo the Great Parish supported the evening NETWORK Caucus. The caucus, organized in a series of progressive conversations, asked participants to discuss the “gaps” NETWORK has described as the major policy concerns of this election year. Participants discussed and suggestive proactive solutions to Mending the Wealth and Income Gap (Tax Justice, Living Wages, and Family Friendly Workplaces) and mending the Access Gaps (access to Democracy, Healthcare, Citizenship, and Housing). There were concerns about the ability of voters to easily register to vote, the influence of the media in the elections, and also worries about gerrymandering. People in Cleveland were worried that even with a great education, it wasn’t possible to find a job that pays a living wage. Adjunct professors talked about how they earn only $18,000 a year teaching full time at the university level. My group felt that if the voice of the people was truly heard, the gaps would be mended. Also Clevelanders wanted to cut defense spending in order to be able to afford healthcare for all. Some spoke about healthcare being a human right. Participants ended the evening by making a pledge to work to end the gaps and then signed the bus making it a bus of all of the communities through which we have travelled. It was a very challenging day, rich with experiences of the American people whose cause for increased access and continued mending of the wealth/income gaps continues to be paramount in the work of NETWORK. Reflection: Even the Sky is Crying, but God is Our Hope!